Gegharkunik Marz, omprised of the five former rayons of Sevan, Martuni, Kamo, Basargecher, and Krasnosyelsk, is dominated by Lake Sevan and the watershed of the numerous streams that flow into it and out down the Hrazdan River to the Arax. The Marz also includes the separate basin of the Getik River, which flows N to the Aghstev and joins ultimately the Kura river in Azerbaijan. The Sevan basin is windswept, treeless and austere, but with stunning skies, an ever-changing lake surface, and a rich history. All around the lake are the tumbled stone remains of Bronze and Iron Age fortifications and towns, and little boulder clumps marking vast fields of prehistoric burials with superb burnished pottery. Lake Sevan enters recorded history with the Urartians. King Rusa I seems to have conquered the Sevan basin and made it the eastern frontier of the kingdom of Urartu sometime around 720 BC. A number of boundary markers of Artashes I written in Aramaic, the Middle Eastern lingua franca, show the presence of the Arsacid dynasty in Hellenistic times. In medieval times, Gegharkunik was dominated by the Dopian clan. At the time of the Russian conquest in 1828, Gegharkunik's population was almost entirely Muslim, much of it Kurdish or Turkmen transhumant tribes. A relatively compact Muslim population remained in the villages of the Vardenis region until the reciprocal ethnic cleansing that took place from 1988-92. Gagarin, an industrial town founded in 1955 and named after the cosmonaut Yuri Gagarin in 1961, is the first settlement reached in Gegharkunik, left of the main Sevan highway. Sevan (18776 p), till 1935 Elenovka, named after the wife of Czar Nicholas I, was founded in 1842 by exiled Russian schismatics, and the town remained all Russian till the end of the 19th c. Sevan is known for its 1000-bed psychiatric hospital. One km N is the cyclopean fortress of Metsep. On a hill just south of the village of Tsamakaberd, just E of Sevan town, is a cyclopean fortress. Turning back west on the old Hrazdan road from the town of Sevan, one first reaches Varser (1626 p, till 1946 Chrchr), first noted in the 9th c., a village given by Ashot II Bagratuni to an Apostles' Church. According to a picturesque popular etymology, the name Varser (from a root meaning "hair") derives from a girl who fell in the lake and drowned, her long hair spreading out across the water. Next is Geghamavan (1609 p), till 1946 Shahriz, founded from Maku in 1830s, with church/shrine ruins in E part of village. Next comes Tsaghkunk (891 p), then Ddmashen (2173 p), founded 1828 from Maku, with S. Tadevos the Apostle church of the 7th c. on the E side. The church remains in decent condition and has a nice old painted wooden altar. Zovaber (1481 p) is the first village reached in Gegharkunik on the old road from Hrazdan to Sevan. Until 1978 Yayji, its residents came from Maku in 1830. There is a S. Stepanos church built in 1860. As Lake Sevan =80= (40 23.00n x 045 17.00e) comes into view at 1890 m, it is important to remember that since the mid-1930s the water level has dropped some 19 m, turning Sevan Island into a peninsula and creating a series of flat shelves and gravelly beaches around the lake. Under Stalin, Soviet engineers had concluded that Sevan's large surface area meant wasteful evaporation. They decided to reduce the surface area of the lake to one-sixth is original size, farming the new land at the S end and using the excess water for hydropower and irrigation. Public outcry and the realization that completing the plan would turn the Sevan basin into a desert killed the plan, but Armenia's engineers have continued to believe in massive intervention, digging huge tunnels to bring water from the Arpa and (this tunnel not yet completed) Vorotan river, so as to allow fuller exploitation of the Hrazdan hydroelectric cascade. "In that time, the venerable Mashtots shone for his amazing virtue on the island of Sevan. ... He received the order in a vision to build a church in the name of the twelve apostles and to set up a religious community there. In his trance, he saw 12 figures walking toward him on the sea, who showed him the place for the church. After this vision and a warning from on high, the great queen Mariam, wife of Vasak of Syunik, came to St. Mashtots and, having persuaded him, built a richly ornamented church called the Twelve Apostles, next a second called the Mother of God. She furnished them abundantly, and made them the house of God and the refuge of pious men, in the year 323 (AD 874)." Per Kirakos Gandzaketsi (Tr. R. Bedrosian), "... lord Mashtots was katholikos for one year. He was a blessed and virtuous man, filled with brilliance and wisdom and he dwelled on the island in lake Sevan practising great asceticism--wearing a single garment and walking barefoot--for forty years he ate no bread and drank no water. It was lord Mashtots who established the book (which is called Mashtots after him), gathering together all the ordered prayers and readings, arranged with an appendix which itself has all the orders of Christian faith. Reaching a ripe age, he gloriously reposed in Christ." The monastery fell on harder times, and there is a terrible tale that, in the mid-18th century, the monks were ashamed lest the visiting katholikos see their collection of ragged and water-damaged manuscripts, and so secretly dumped them in the lake. The Russians' tame French Caucasus expert Jean-Marie Chopin (Ivan Shopen) reported that in 1830 the monastery had an abbot, five monks, 5 archdeacons, 7 protodeacons, 1 priest, and 11 servers. He noted that the monastic regime on the island was exceptionally strict, that meat and wine were banned, as well as women and youths. The monastery therefore served as reformatory for monks Ejmiatsin had banished for their transgressions. Chopin listed the monastery's property: five villages, four mills, a ruined dairy, 46 farm animals, and gardens and fields. Eli Smith reported in 1830 that one of the monks was a serious teacher, and manuscripts were still copied there by hand as late as 1850. Passing on the steps a monument to a 20th c. navy captain, lonely commander of the Sevan fleet, one reaches first the Arakelots (Apostles) church and then Astvatsatsin (Mother of God), the latter with various khachkar fragments in the courtyard. These churches were restored in the 17-18th c, and extensively rebuilt recently. The other monastery buildings have mostly disappeared, though there are foundations of a third church, S. Harutyun, above. Nothing is visible of two smaller ruined shrines ruined by earthquakes, including one to S. Karapet. Ruins of the medieval Sevan fortress have also entirely vanished. Beyond the monastery parking area, the road continues past a police checkpoint to modern, assertive guesthouses belonging to the Writer's Union, the Government, and the President. There is a commercial bathing beach below the monastery. Somewhere on the peninsula are scant remains of a cyclopean fortress. Exiting right (S) at the outskirts of Sevan (towards Gavar), then hard right immediately at the end of the exit, will take you to Lchashen (4212 p), till 1946 Ordaklu, inhabited from before 3000 BC. There are remains of a 13th c. church, and an Iron Age fort 3 km S, with Urartian occupation; 3 km E is the major Bronze Age cemetery. The cemetery can be more easilty accessed by taking the new Sevan-Gavar road (ie, take a gentle right at the end of the exit ramp) and then turning right onto a wide (but overgrown) concrete road very soon after a a beautiful grove of trees along the main road. This concrete road goes about 0.5km, at which you should turn right onto what is the first alsphalt road to the right. Approximately 0.2km W on this road will bring you alongside the cemetery mounds. Excavations here identified the predominant Late Bronze Age cultural type in Armenia, the so-called Lchashen-Metsamor culture dating from about 1500 BC to the Urartian conquest in the 8th century BC. Two chariots excavated at the site and other interesting materials are now on display in the State History Museum in Yerevan. 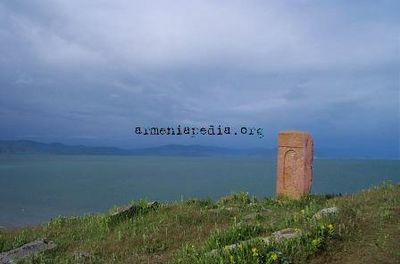 Near the cemetery, on the left side of the Sevan-Gavar road about 15-20 m from the road, there is an inscription of Arghishti I carved in the rock facing the lake. Next village, again W of the road, is Chkalovka (490 p), founded 1840 by Russian emigrants as Alexandrovka, renamed in 1946 for Valeri Chkalov, famed test pilot and Hero of the Soviet Union, killed during a test flight in 1938. A paved but badly potholed village road parallels the main highway S, connecting Chkalovka to Norashen (440 p, founded 1920, in SW part is church, cemetery, Aghli Berd cyclopean fort 2 km W), Tsovazard (1963 p, till 1978 Mukhan; Bronze Age burials, church rebuilt in 19th c.), Lchap (1039 p, till 1945 Aghzibir, with a cluster of three Early Iron Age cyclopean forts E and S, with caves nearby) and ultimately Gavar. Hayravank Monastery with Lake Sevan below it. Berdkunk (251 p, formerly Aghkala), was a transit point on the ancient Dvin-Partev road. On the E edge of the village is a cyclopean fortress called locally Ishkhanats Amrots. From the village 1 km W and 200 m SE of the left edge of the Sevan-Gavar road is a cyclopean fortress with megalithic tombs. Hayravank or Ayrivan (685 p); 22.4 km from the Sevan highway, on the left (E of the road) shortly after the Geghama Pensionat, a paved road leads to a rock outcrop with a fine view of Lake Sevan. 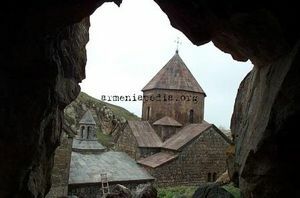 There stands Hayravank Monastery* =80= (40 25.97n x 045 06.56e), with a late 9th c church, a 12th c. gavit, and khachkars. The rocks just NW preserve substantial walls of a Bronze Age through medieval fort and settlement; nearby are Iron Age tombs. There are two shrines in the village, with inscribed khachkars. Exiting E at a somewhat over-engineered cloverleaf intersection leads one toward Lake Sevan and the ancient village of Noratus* or Noraduz (5465 p). Turning right at the first street past the bridge leads to the S edge of town and S. Grigor Lusavorich church/Daputs Monastery of the 9-10th c., rebuilt by the 11th c architect Khachatur. Continuing straight into the center of village, the second left leads to the ruined S. Astvatsatsin church, a basilica built by Prince Sahak at the end of the 9th c., probably on earlier foundations. Outside the W door are intriguing carved grave monuments. 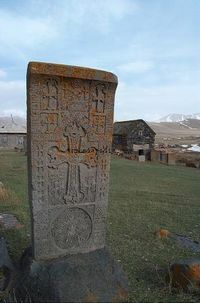 On the E edge of town is a huge medieval-modern cemetery with an impressive array of early khachkars* =70= (40 22.40n x 045 11.05e), the largest such collection of khachkars in Armenia, as well as evocative modern funerary statuary. Continuing up the bare, windswept hillside beyond, there is a smaller cluster of khachkars around a medieval funeral chapel. Two km E of Noratus on the top of a hill is the Heghi Dar cyclopean fortress with a large tomb and two big inhabited caves. On a promontory N of Noratus is a large, well-maintained forest of antenna masts, ostensibly belonging to Armentel. A couple of km S of Noradus, near the former village of Artsvakar (formerly Ghshlakh, now a suburb of Gavar), are the Early Iron Age cyclopean fortresses of Ghslakh (near the lake), Zhami Dar (just W of Artsvakar) and Mrtbi Dzor (S of Zhami Dar). West of the main highway on the cloverleaf is Gavar (23302 p), the marz capital, founded in 1830 by migrants from Bayazit in Turkey, with city status since 1850. Till 1959 it was called Nor Bayazit, then Kamo, from the nom de guerre of Simon Ter-Petrosian (1882-1922), a "professional revolutionary" who robbed banks for the communist cause and escaped from various Czarist jails. He died in a car crash in Tbilisi. Most of Gavar's industry is defunct, except for the cable factory. There is a folklore museum, an airport, and a bishop, who for lack of suitable quarters spends most of his time closer to Yerevan. The Early Iron Age fort of Berdi Glukh occupies a long, slender rocky hill, now a modern cemetery, paralleling the Gavaraget stream, behind the Haldi hotel on the main square. The fort includes early cave dwellings, towers and an underground passage to the Gavaraget. Just S is a large Early Iron Age cemetery. Urartian inscriptions lend credence to the theory that this was the center of the ancient Urartian district of Velikukhi. There are cyclopean fort remains all around the city, particularly one 5 km E of Berdi Glukh. Bearing somewhat right on the road at the bottom of the main square takes one to the suburb of Hatsarat, with the small domed S. Astvatsatsin church, built in 898 by the will of Prince Shagubat Arneghati, and the 19th c. S. Grigor Lusavorich church adjoining, which still operates. Another cyclopean fort also called Berdi Glukh, with a large tumulus, is on the NE edge of Hatsarat by the modern cemetery. Just W of Gavar is Tsaghkashen (521 p, founded in 1859) with S. Hovhannes church of the 9-10th c.
A badly rutted road leads S first to Gandzak (3869 p) whose residents came originally from Mush, Bayazet, and Alashkert; it was called Batikian until recently, named for Batik Batikian (1892-1920), a communist agitator shot by the Dashnaks after the failed May 1920 uprising. The village was known previously as Kyosamamed. There is a half-ruined Astvatsatsin basilica of the 4-5th c, S. Gevorg domed church of 9-10th c. Next village S on the road is Sarukhan (6218 p) on the bank of Kukudzor Creek. Its residents came in 1830 from Kogovit district. Once called Dalighardash, it was renamed for the professional communist revolutionary Hovhannes Sarukhanian (1882-1920) from Nor Bayazit, who was shot by the Dashnaks after they quelled his attempt at a Communist seizure of his home town during the failed May 1920 uprising. On a hill called Tsaghkavan on the N edge of the village is a cyclopean fort. The next village, Lanjaghbyur (2112 p) was called Kyuzajr till 1950. It was founded in 1828 by migrants from Alashkert and Bayazit. On the slope of the SE hill is Ilikavank or Paravi Vank, stylistically dated to the 7th c. Near the monastery are cyclopean building remains covering an area of 70 hectares. Gegharkunik (1693 p, till 1946 Bashkend) is the end of the road, except for jeep trails leading up to the summer pastures of the Geghama range. Its inhabitants came from Bayazet etc. in 1828. There is a tumble-down church/shed in village., and a humble S. Gevorg church on a hill beyond. Back on the main road S from Gavar, one first reaches Karmirgyugh ("Red Village" 5106 p, till 1940 Ghulali), which was founded 1831 by migrants from Bayazit. In the center of the village are ruined churches of S. Grigor and S. Astvatsatsin, with khachkars. A boundary stone inscribed in Aramaic of King Artashes was found here, and there are Urartian ruins nearby. Some 12 km S of Gavar, on a peninsula jutting into the lake, is Kanagegh medieval settlement with khachkars and a cyclopean fortress. S of Karmirgyugh, a turn-off W leads to Eranos (4264 p), with an Astvatsatsin church of 1215 (bear left inside the village) and Tukh Manuk and S. Sofia shrines. Left of the Gavar-Martuni road, by the old chicken farm, are cyclopean fort remains. A rutted road leads S from Eranos to Vardadzor (2110 p), founded 1828-29 from Mush, with an Urartian inscription of 722-705 BC. This road continues to Dzoragyugh (3596 p, reoccupied 1930., named for its position in a river gorge. Turning W to follow the stream through the village, then keeping on the left (S) side of a tongue-shaped hill, one reaches on the W edge of the village the ruins of Shoghaga Vank of the 7-17th c. and its surrounding cemetery. The church is labeled S. Petros and dated 877-886; it was apparently another work of Princess Mariam, the sponsor of Sevanavank. Retracing steps, the road continues S to an outlying section of the village with the Masruts Anapat (hermitage of Masru) of the 9th c., visible through houses about 200 m W of the road. The church, maintained lovingly and kept locked, still operates. A local woman keeps the key. On a hill 2 km W of Dzoragyugh is the Sangyar cyclopean fort occupying 40 hectares. Continuing S, turning W brings one to Tazagyugh (2264 p, formerly Tazakend). There is a Grigor Lusavorich church of 9-10th c and a 16th c. S Astvatsatsin. A good dirt road continues W into the mountains. In the opposite direction from Tazagyugh is Tsakkar (2140 p), founded in 1828 from Mush. It allegedly has a natural bridge, a church rebuilt in 19th c., and a boundary stone of Artashes I. NW on Bakhtak creek is a Hellenistic settlement. Lichk (4135 p), formerly Gyol ("lake"), was founded in 1830 by migrants from Alashkert. Cyclopean fort, medieval town remains, S. Astvatsatsin church and 13th c. khachkars. Tsaghkevank is on a level hill summit on the SW edge. 1.5 km W is Ghrer Bronze Age burial site. Next village south, Nerkin (lower) Getashen (7061 p, till 1945 Adyaman), was an early medieval capital of the region. The road from the main highway is signposted in Armenian. 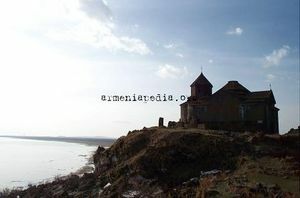 The 9th c. Kotavank church is perched on the ridge overlooking the village and the Argich river. Kotavank was built by Grigor Supan, son of Princess Mariam. On the main village road just beyond the dirt road up to the church, is a tumble-down little basilica hiding behind a prefab store. Arranged with stalls as a barn, this church preserves many khachkars built into its walls. On a hill 2 km E is a cyclopean fortress, where a cuneiform inscription of Rusa I was found. Another cyclopean fort 3 km W is called Berdi Dosh. South of Lower Getashen is Verin (upper) Getashen (4203 p), founded 1828-29 from Mush and Alashkert; S. Astvatsatsin, S. Sargis churches. The road continues S to Madina (1031 p), whose residents settled there in 1922. The mountain west of Madina, the extinct Armaghan volcano, rises 450 m above its surroundings, with a small lake in the crater. Martuni (11117 p), anciently Mets Kznut, from 1830-1922 Nerkin Gharanlugh, from 1926 Martuni, former rayon capital, named for first Soviet PM Myasnikian's nom de guerre. It has various non-functioning industries and "Martuni" Rest House. Astvatsatsin church rebuilt in 1886; on the S edge of Martuni left of the Martuni-Geghhovit road are cyclopean fort ruins above the modern cemetery. South from Martuni on the road that leads to the Selim Caravansaray and Yeghegnadzor, one first reaches Geghhovit (5141 p, till 1968 Verin Gharanlugh; founded in the 15th c, but current residents from Alashkert in 1823). In the village is a S. Gevorg church. The small modern cement church just on the S end of town was erected by the local member of parliament, perhaps for electoral purposes. There is a small cyclopean fort on the hill above. In the middle of the village, a road descends SW and crosses the river. Turning left at the first opportunity after the river, you reach a hilltop just S of the village with walls of an Iron Age fort (best seen at S end) excavated in 1997 by an Armenian-Italian team. Supposedly the medieval Alberd fort, mentioned in connection with a 9th c. Byzantine military campaign, is here as well, with a shrine of S. Mamas. 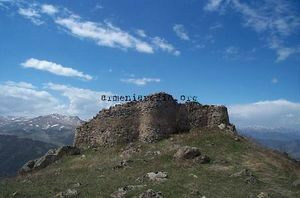 About 4 km S of Geghhovit, on a hill E of the road where the Martuni and Dashtidzor rivers come together, is a Berdi Glukh cyclopean fort. The paved road passes Lernakert, then ascends (now unpaved) into the mountains toward the Selim Pass/Caravansaray and Yeghegnadzor. Just E of the road before the summit, a series of boulders have carved on them faint outline maps of the major constellations (39 57.33n x 045 14.10e), possibly dated to the 3rd millennium BC. Sev Sar, the mountain just East, also has important petroglyphs. Two other interesting petroglyphs can be found at (40 01.66n x 045 17.26e) and (40 01.65n x 045 17.48e). Vaghashen (3259 p, till 1935 Abdalaghalu), has two 16th c. churches and (1.5 km S) Kyurdi Kogh and Aloyi Kogh cyclopean fort ruins,. Village was founded 1828-29 from Mush, Alashkert. 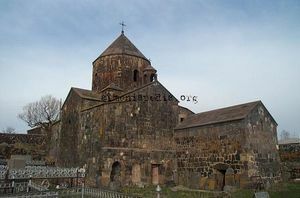 Then Astghadzor (3546 p), till 1935 Alighrkh, historically Kats or Katsik; Poghos-Petros church in the village, and old churches and khachkars, including shrines of St. Hripsime, following the gorges SE and SW of the village. On a high hill SW of the village, a little shrine had another Aramaic boundary stone of King Artashes I. There are cyclopean fort ruins of Vanki Amrots 3 km S, and Iron Age graves in the vicinity. Zolakar (5720 p), till 1935 Zolakhach, settled in 1829 from Alashkert; with funerary monument in center. Tukh Manuk and S. Sargis churches, Bronze Age cemeteries. Vardenik 7765 p, till 1945 Gyuzeldara), on Vardenis river, cyclopean fort ruins of Kaftarli 3 km S, with rock carvings downhill on the right bank; also churches, shrines; founded 1828-29 from Mush. E of Tsovinar (3997 p), on a hill cut by the old (and very rough) road between Tsovinar and Artsvanist, is the Urartian city of Teyseba, (modernly Odzaberd or "Serpent Castle") founded by Rusa I (approx 735-713 BC), the best-preserved Urartian fortification in the Sevan Basin. The site is best reached from the spur to Artsvanist, turning right (W) on a little dirt road toward Tsovinar. Carved into a low cliff below the road on the Lake Sevan side is a worn cuneiform inscription of Rusa I recounting his conquest of 23 countries. With equal arrogance, the modern engineers of the Arpa-Sevan tunnel chose the hill of Teyseba to be the point where the tunnel debouches on the lake. Up the hill S of the road there are various walls of boulders, preserved particularly on the S side of the hill fortress. Artsvanist (2839 p) till 1968 N. Aluchalu, founded in 1829-30 by migrants from Alashkert. As the road reaches the center of the village, bear half-left at the war memorial and follow the gorge a few hundred meters to Vanevan* =40= (40 08.80n x 045 31.02e), an important work of 10th c. regional architecture. The main church of S. Grigor (left) was built in 903 by Prince Shapuh Bagratuni, brother of King Smbat, and his sister Mariam. The right-hand church may be contemporary, but the gavit between them was added later. There is a spring and a shallow cave behind the monastery. Father Tiratur Hagopian, son and grandson of priests serving this village, is attempting to revive Vanevan as the center of an active parish. Continuing straight S through the village, one sees on the left across the gorge remains of an early cemetery and church. 3 km S is Kolataki S. Astvatsatsin of late 9th-early 10th c., and Hnevank of 10th c. In the same area is Bruti Berd cyclopean fortress. The area between Vardenis and Lake Sevan used to be the shallow Gilli Lake and surrounding wetlands, home to vast populations of migrating birds. The wetlands have almost disappeared, however, due to the fall of the water level in Lake Sevan. The Vardenis region was heavily Azeri Muslim in population until 1988, with only a handful of its 30-odd villages predominantly Armenian. Since 1989, there has been modest resettlement by ethnic Armenian refugees from Azerbaijan, as well as reoccupation of the now renamed Azeri villages by local farmers. The road E through [[Vardenis continues on to the Zod gold mines, inactive in recent years but taken over in 1998/99 by a multinational mining company. Just beyond the mine works and a Military Police post, the dirt road crosses a pass (2366 m, often closed in winter) into Kelbajar district, technically a part of Azerbaijan but now controlled by Karabakhi Armenian forces. The road then proceeds as far as Mardakert in northern N-K. There are daily buses from Mardakert to Yerevan, and occasional trucks bringing firewood cut in the occupied territories. Karchaghbyur (2291 p) has petroglyphs in the gorge of Karchaghbyur river; SE is Berdidash cyclopean fort with two Christianized pagan shrines; 2 km W are Bronze Age burials. Beginning in 1975, archaeologists have been excavating a Persian and Hellenistic period walled settlement on a promontory jutting out into the lake. The site was abandoned at the end of the 1st century BC, with mass burials of that period. Some 5 km E of the Karchaghbyur turn-off, in a little wood, is an unsignposted right turn for Tsovak (2549 p), with a cuneiform inscription of Sarduri II of the 8th c. BC, cut in the rock on the N edge of a huge Iron Age cyclopean fort occupying the hill forming the S and W side of the village. After 1 km, take the right fork which winds up onto a narrow spine of rock, with khachkars, the road leading S to Lchavan (557 p, till 1967 Yarpuzlu, Bronze Age tombs, church of 13-14th c, khachkars) and then Makenis (495 p). Makenyats Vank* =40= (40 07.50n x 045 36.83e), right of the road about 100 m inside the village, was a major cultural/education center of medieval Gegharkunik with 10-13th c. churches. Prince Grigor Supan built the central S. Astvatsatsin church (locked) at the end of the 9th c. In the near corner of the walled enclosure, hanging out over the gorge, is a picturesque medieval sanitary facility. The road continues to Akhpradzor (337 p), till 1978 Verin Zaghalu. Past the turn for Tsovak, the road passes Vanevan (325 p) formerly Shafak, and Torfavan (507 p, formerly Kamishlu?). A right turn leads to Lusakunk (1289 p, formerly Tuskyulu), Khachaghbyur (1145 p, formerly Chakhirlu or Sovietakert, with ruined Iron Age fort, 13th c. church), and Geghakar (126 p, formerly Subatan). Vardenis (11465 p) till 1969 Basargechar, anciently Vasakashen, was settled in 1830 from Western Armenia. There are two hotels as well as Bronze Age tombs. Leaving the village on the E road (the 10 o'clock turn on the roundabout), there is on the left a large late 19th/early 20th c. Astvatsatsin church, built on earlier foundations. Surrounding the church are fine khachkars and tombstones of a 16th c. burial ground. Heading S from Vardenis, one road goes to Akunk (3469 p, till 1935 Ghrkhbulagh, 6-4th c. BC fort, Klor Dar cyclopean fort W of village, Bronze Age settlement, two Tukh Manuk pilgrimage sites), and another (the right-hand turn at the main Vardenis roundabout) goes to the eerie but appealing village of Ayrk* =30= (348 p, till recently Dashkend). In Ayrk, take the right fork at the village store, and watch out on the right for the Astvatsatsin Church (dated 1181) and, 150 m beyond, the Katoghike S. Gevorg church of 13th c., both with substantial graveyards. Between the two churches are massive stone walls of an Iron Age fortification, with shallow caves below. Taking the left fork at the store, one comes to the essentially abandoned hamlets of Nerkin Shorzha (69 p), and Verin Shorzha (46 p). Mets (big) Masrik (2589 p) or Mets Mazra, habitation attested since the 7th c, has a famous khachkar of 881, a 17th c. church, two shrines of 12-13th c. Then Pokr (little) Masrik (676 p,) with 12-13th c. church and khachkars. W of the road is Norakert (857 p) founded in 1927 as a state farm specializing in wheat seed. Continuing N, one reaches Geghamasar (1068 p, formerly Shishkaya, with 16th c. church, cemetery N of village), Areguni (360 p, formerly Gyuney, till 1935 Satanakhach), Daranak (205 p, formerly Dara, founded 1921 by people from Pambak), Pambak (596 p, churches, caravansaray, cemeteries), and Tsapatagh (274 p, formerly Babajan), with a Tufenkian Hotel and Restaurant (http://www.tufenkian.am). The road continues around the lake, passing through the former Krasnosyelsk region. North and East of the main road are the villages of Kakhakn (417 p, formerly Karayman or Sovietakend, with 13-16th c. khachkars), Arpunk (436 p, formerly Kyasaman, since 1978 Bahar, with 15th c. church 3 km SE), and Avazan (253 p, till recently Gyosu). From Mets Masrik spur roads go NE to Kutakan (230 p, formerly Gyunashli, till 1968 Janahmed), Tretuk (189 p, formerly Inakdagh, in 1978 became Yenikend) and Aghyokhosh. East of Vardenis on the road to Sotk (past the church, then angle right at the next traffic light), the first right turn leads to Shatjrek (517 p, formerly Ghoshabulagh), Jaghatsadzor (140 p, formerly Sariyaghub), and Geghamabak (112 p, formerly Ghayabagh). Next right leads to Shatavan (533 p, formerly Narimanlu, with 15-16th c. cemetery) and Norabak (334 p, formerly Azizlu, before then Mets Gharaghoyun). Continuing straight, the road reaches the gold mining town of Sotk (1053 p, formerly Zod, founded in 1969 on the Zod river). In the village is a large three-aisle basilica of S. Astvatsatsin, said to be 7th c. but with 13th c. gravestones built into the walls. South of the road are Azat (165 p, till 1935 Aghkilisa, with a pair of khachkars and the poor remains of an 11th c. church), and Kut (283 p, formerly Zarkend, till 1935 Zarzibil, founded 1801). Past the Sevan peninsula, the road forks right to Chambarak (still known to most by its old name of Krasnosyelsk). The left fork leads to Dilijan and beyond, passing first through Tsovagyugh (3885 p), till 1935 Chibukhlu, Karatap has ruins of church; on an egg-shaped hill NE is an Iron Age fort. Just before the top of the pass leading to Dilijan is Semyonovka (302 p), a Russian village founded in 1849. Chambarak and the former Krasnosyelsk rayon on the far side of Lake Sevan are best reached by driving N from Sevan and around the lake, paralleling the railroad line to the Zod gold mine. After passing a series of lake resorts, the E Sevan shore becomes national park. A turn-off left (at 26.4 km from the Dilijan/Krasnosyelsk fork) leads to Drakhtik ("litte heaven", 1023 p), formerly Tokhluja, with old cemeteries. A substantial asphalt road (at 27.9 km) left leads over the Chambarak pass (8.3 km), which marks the boundary between the Sevan/Hrazdan/Arax watershed and that of the Getik, which flows N and E into the Aghstev and Kura rivers. At about 16 km one reaches a fork on the outskirts of Chambarak (6198 p), the left track passing through the administrative center of the former Krasnosyelsk rayon. Chambarak was founded in 1835-40 on the Getik ("little river") by Russian immigrants, with the name Mikhaylovka. In 1920 it became Karmir gyugh ("Red village"), then in 1972 Krasnosyelsk (meaning the same in Russian). This is a border region whose eastern defensive positions are still subject to occasional shelling. At the far end of town (jog right then left in the center), one reaches a crossroads. Turning left to follow the Getik, one sees on the right, five houses before the NW edge of town, the (reportedly still functioning) house museum of the Borian brothers. Armenak, one of the 26 Baku commissars, was shot by Bolshevik-fearing Turkmen in September 1918, while his more successful brother Bagrat, revolutionary, Pravda correspondent, and Central Committee member, met his maker in 1938 after fatally underestimating the role of Russia in his history of Armenian diplomacy. Chambarak also boasts some 13th c. khachkars. Turning right (SE) in Chambarak, the road leads to Vahan (1161 p), formerly Orjonikidze, founded in 1925 in honor of Sergo Orjonikidze (1886-1937), the great Caucasus revolutionary. At the E end of Vahan, on a hill between two tributaries of the Getik, is an Early Iron Age cyclopean fort.. From Vahan, the road used to continue E into Azerbaijan and thence into the Armenian enclave of Artsvashen, a large village known until about 1980 as Bashkend. 7 km E on this road (you may be shot at if you get this far) are ruins of another cyclopean fort. Artsvashen was founded in 1845. It was the birthplace of Hero of the Soviet Union Saribek Chilingarian, who in April 1945 raised the Red Flag over the fortifications of Berlin. Artsvashen was captured by Azeri forces in August 1992, one of the most painful reverses suffered by Armenia in the N-K dispute. Beyond the Chambarak turnoff on the road S. to Vardenis, a smaller road leads E to Aghberk (289 p), until recently Aghbulagh and inhabited by Azeris. Just beyond this turnoff is the small village of Shorzha (551 p), with a 17th c. chapel/cemetery on the S edge of town, a ruined chapel on the hill above, and an Iron Age fort somewhere in the vicinity. South of the village, a paved road angles SW onto the Artanish peninsula. There is a substantial vacation compound, including gravel beach, now belonging to the Union of Artists. The main road south deteriorates after Artanish (720 p, ruins of cyclopean fortresses on hill just to W, also 5 km SE, also 1 km N; church, cemeteries); and Jil (681 p, founded in 12th c., with Dashti-ler fort 2 km N). The entire Sevan coast, from Artanish to Jil is perfect for a number of activities. The beach is extremely long and sandy, the water is nice, there is a little strip of forest all along the beach, and the entire area is uninhabited. This beach is an ideal and solitary area for camping, sunbathing, swimming and hiking. Crossing the Getik and turning left, a bumpy asphalt road passes the Borian house museum and follows the river NW toward the Dilijan-Ijevan road. At 8.4 km past the Krasnosyelsk intersection, just beyond Ttujur ("sour water", 1054 p, Kotrats church, Tsak kar ruined settlement), a good dirt/asphalt road ascends back to the east and then climbs N toward the Shamsadin region of Tavush Marz and the town of Berd, becoming perhaps the most spectacular road in Armenia. (see Tavush section, Map O). Next village on the main road is Getik ("little river", 471 p) formerly Nor Bashgyugh ("New chief village"), founded in 1922, with megalithic monuments, khachkars, and an Iron Age cyclopean fort (Mughani Khach). Next village, left of the road, is Martuni (671 p, named for first Soviet Armenian PM Alexander Myasnikian's cover name; Iron Age forts; medieval churches at Aghjkaghala). Approximately 0.1km past the third bridge over the Getik in Martuni, a rocky road angles steeply up N and continues towards the 10th c. Castle of Aghjkaghala* =30= on the ridgeline. Note that after about 1.5km this road is begining to show signs of subsidence and should probably not be attemped in a heavy vehicle after any period of rain. Next turnoff, a good dirt road crossing the river about 100 m before two wooden houses on the right, leads S and up through woods to the ruins of Old Getik monastery, predecessor of Goshavank or New Getik. The monastery was ruined in an earthquake, and the remaining walls are only about 2 m high. The dirt road continues to Jivikhlu, once home to 40-50 Azeri families, now occupied by 10 Armenian families, refugees from Artsvashen. The main road next reaches Aygut (1004 p, till recently Gyolkend, named in Turkish from 7 little nearby lakes) on the main road. From Dprabak (626 p, formerly Chaykend, founded in 1778 by migrants from Kazakh and Karabakh), a road S goes to the once Azeri villages of Barepat, (Bariabad) and Kalavan (168 p, formerly Amirkher). After Dzoravank (222 p, formerly Gharaghaya), there is a turn-off left to Antaramej ("In the woods", 227 p, till recently Meshakend, till 1978 Yanighpaya), and then the main road reaches the border with Tavush Marz. This page was last edited on 15 October 2018, at 05:40.